I'm giving these cards to my kids after introducing division two lessons ago. Some of my kids are understanding the concept, while some of the kids still need a bit more review. 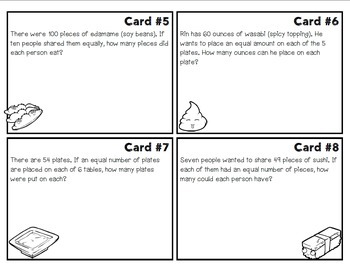 These division word problem cards are meant to get kids thinking a bit more about basic division and strategies they can use to solve. 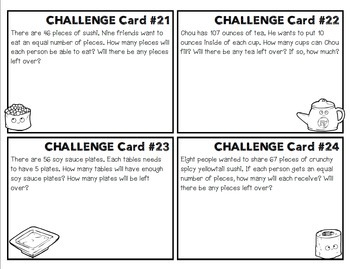 Included are 24 task cards. 20 of the cards are basic division with no remainders, and 4 of the cards have remainders for kids that may want a bit of a challenge. 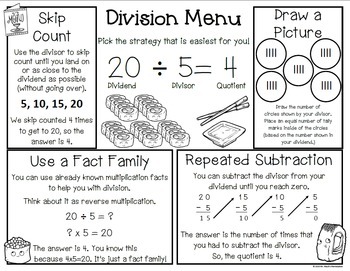 There is also a page included explaining how to solve a division problem in 4 different ways. This is a quick and easy tool for kids to keep in their folders, and when they get stuck, they can pull this out as a reference. Answer key is also included, along with the recording sheet. 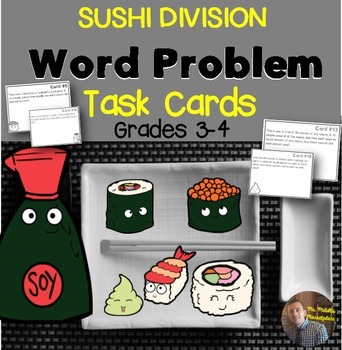 All of the cards are sushi themed, with SUPER CUTE clip art by Our-Monitos.